Information on understanding and conducting fishing vessel energy audits, provided by the Alaska Sea Grant Marine Advisory Program. A vessel energy audit is a process for determining how a boat and its systems use energy. Fishing vessels typically have propulsion, electrical, hydraulic and refrigeration power demands, all met through burning diesel fuel. Ideally an energy audit reveals components of the vessel or its operations that are energy-inefficient, and points to possible energy conservation measures (ECMs). An ECM could be replacing an inefficient component with a modern “premium efficiency” model, or a change in operational behavior such as running the vessel at a more fuel-efficient speed. An energy audit produces baseline data to be compared with energy consumption after ECMs have been applied. ECMs must be both technically feasible and cost-effective, so financial analysis is part of a complete energy audit. In 2009 the Alaska Sea Grant Marine Advisory Program (MAP) launched a project to help fishing vessel owners control fuel costs. The preceding year fuel prices had spiked to record levels, and many fishermen who responded to a Sea Grant survey expressed concern about the future viability of their fishing businesses. MAP participated in planning and conducting the Food and Agriculture Organization (FAO)–sponsored 2010 International Symposium on Energy and Fisheries, and subsequently began seeking ways to provide focused, research-based energy conservation recommendations to Alaska fishermen. MAP convened an advisory group that included the Alaska Marine Conservation Council, the Alaska Fisheries Development Foundation, the United Fishermen of Alaska and individual vessel owners, which recommended that the next step should be vessel energy audits. Some marine engineering firms conduct vessel energy audits, but due to the high cost only fleet owners, shipping companies, government and the military normally can afford them. On the advisory group’s recommendation and with small financial contributions from several industry organizations, MAP contracted with Elliott Bay Design Group to create a template for vessel owners to conduct their own audits. The template was presented at a Pacific Marine Expo seminar in 2011. Feedback indicated that the template helped owners organize vessel data but didn’t adequately support ECM recommendations. The following year the Alaska Fisheries Development Foundation made a major contribution to the effort by securing funding from the state legislature and contracting marine engineering firm Alaris Companies to collect operational data from vessels in Alaska. Engineer Mike Gaffney placed instrumentation on trollers, gillnetters, longliners and one tender in Southeast Alaska, as well as one trawler in Kodiak. Data were collected on engine-specific fuel consumption, propulsion, AC and DC electrical demand, hydraulic power and refrigeration energy use. Gaffney presented AFDF pilot project results at Pacific Marine Expo in 2014, and introduced the Energy Analysis Tool developed by the Alaska Longline Fishermen’s Association (ALFA). The AFDF–sponsored pilot project primarily produced baseline data on a range of certain types of fishing vessels. As AFDF secures additional funding, the project will be extended to address other classes of vessels and will complete the audit process with detailed costs and savings analyses. Based on Alaris data, the Alaska Longline Fishermen’s Association, assisted by a Yale University intern, created an interactive Excel spreadsheet program called Energy Analysis Tool (EAT). Using instrumentation-recorded or owner-supplied operational data, it displays a vessel’s energy use by system. The owner can enter projected performance data by applying selected ECMs, and the tool calculates potential savings. 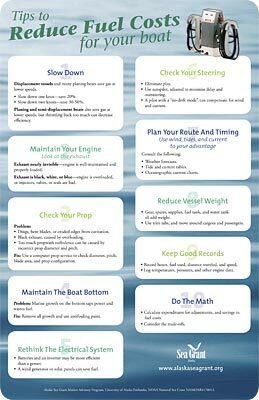 Visit Alaska Sea Grant Marine Advisory Program's Alaska Vessel Fuel Efficiency Resources website for information, publications, and other resources on coping with high fuel costs, tips for conserving fuel, the future of diesel fuel, and more. See sidebar for links to project presentations, publications and worksheets. The energy analysis tool (EAT) developed by ALFA is undergoing refinement and will be posted here when it is fully operational. Sources for efficiency-related technology, further studies and results also will be posted here as they become available. Last modified 9 February 2016, 5:25pm AKST. For website issues, contact Alaska Sea Grant web coordinator.